• Dogs must be healthy, sound, and trim. If you have any concerns about your dog’s health, please consult your veterinarian before enrolling. • Dogs must be at least one year old and current on vaccinations. • Dogs should be able to be handled by strangers. • Dogs should come when called when off leash. • Aggressive behavior or out-of-control dogs are not permitted. • Dogs must be able to tolerate the approach of another dog. • Dogs must be able to tolerate another dog running past them. In order to provide each student with personal attention, the class sizes are limited. Fees for classes are non-refundable once the classes have started. Note: The check will hold your place in the class, but will not be deposited until right before the class starts. Please contact Becky to confirm your place in the class (your space is not confirmed until a check is received). If the classes are already full, your name will be put on a waiting list for the next available class. For a registration/information packet: download it here. To help prepare you for taking an agility class, you can start training your dog in some basic behaviors such as attention to you, quick name response, sit, down, and MOST IMPORTANTLY, a RECALL (calling your dog to you and they actually come!). 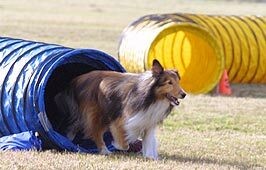 A great recall is ESSENTIAL in agility - you should train your dog for it every day (in several short sessions) and make it fun. Although we don't require any formal training to start agility classes, the more training your dog has, the more successful you'll be in agility. If your dog won't come to you in the park when you call him, he's probably not ready for agility yet. In the registration/information packet, there is a handout on teaching a recall to your dog. 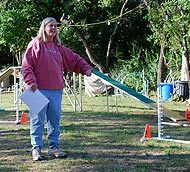 On the "Links" page of the website (under Dog Training), there are some useful training websites with both videos and articles. For Directions to the field, click here. If you would like to come and watch a class, click here for current class schedule.